How do I copy an individual shift? Learn how to copy one shift as well as a shortcut to do this quickly! 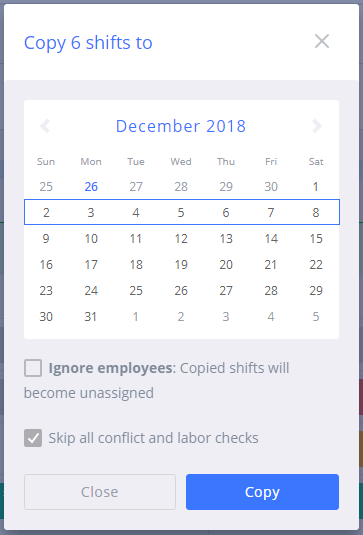 If you only want to copy one or a few shifts, you can check off those shifts you wish to include and then use the copy button that will appear at the top left of the page. You will also get the chance to choose which week to copy to as well as the option to revert them to unassigned shifts and skip conflict and labor checks. If you would like to copy a shift quickly within the calendar view, you can also hold down CTRL or Command on your keyboard while you drag and drop the shift to its new slot.